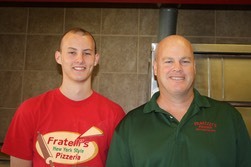 Fratelli's is an independent, locally owned family business. We make our dough daily from scratch and cook our own sauces. We even blend our own salad dressings. The dishes that we make are not made ahead, but made to order. Our recipes come from family members who have pizza parlors in Brooklyn, NY and New Jersey for over 30 years. We want you to be 100% satisfied. Any comments or suggestions that you have would be most appreciated (in person, via email, or by phone to 513-777-5061). We strive to continually make your experience at Fratelli's a better one. We guarantee we will do all we can to make your visit enjoyable!